AlphaNinja - Kona Grill (KONA) went public a few years back. A casual dining story with a tiny footprint but nice growth plans. Unfortunately, per-restaurant results kept underwhelming investors, and the company did not have the capital (or access to it) to expand at the once hoped-for rate. Then this year, the company tried stealing from its investors. Well, to be precise they tried giving management's family completely inappropriate terms in a possible financing. Mill Road Capital has been waging a bit of a 13d battle with the company, taking management to task both for poor performance and mistreatment of regular shareholders. 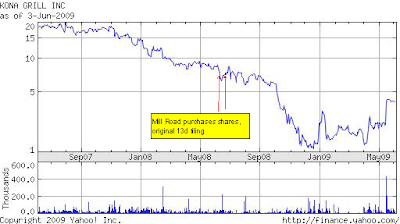 Mill Road's average purchase price appears to be in the $4 range, so they can be none too happy. In the absence of agreement over the financing, Mill Road offered to purchase the company on May 18th. This resulted in the resignation of CEO Marcus Jundt on the same day. "Mill Road is therefore pleased to submit a non-binding offer to acquire all of the Company’s shares for cash in a transaction valuing Kona’s total enterprise value at $27.9 million or $4.60 per share for each of the approximately 6.5 million shares currently outstanding. This represents a 101% premium to the closing price of $2.29 as of May 15, 2009 and is 10.5x LTM EBITDA. " 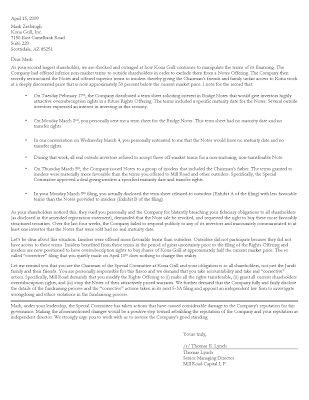 "On Thursday March 5th, the Company issued Notes to a group of insiders that included the Chairman’s father. The terms granted to insiders were materially more favorable than the terms you offered to Mill Road and other outsiders. Specifically, the Special Committee approved a deal giving insiders a specified maturity date and transfer rights." 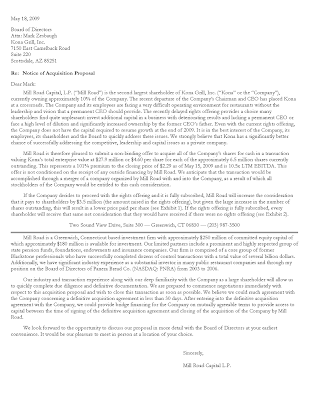 Today, Mill Road Capital has proposed an alternative financing to the one management had attempted - the management proposal resulting in shareholder fury at being treated as second class citizens, while offering insiders and their family members special terms. AlphaNinja - Best of luck to KONA shareholders, this management has been a disgrace.